The 1966 Green Bay Packers football playbook for offense is available for $40 download and $79.95 hardcopy. Football Playbook page above (Click to expand) verifies its validity; it is from the 1966 Green Bay Packers Offensive Playbook by Vince Lombardi. 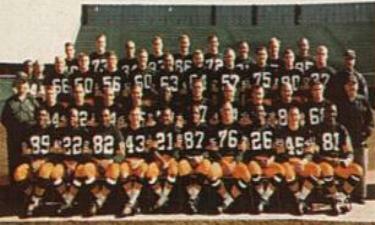 The power sweep was introduced and made famous by the Green Bay Packers during this era; its implementation a product of Vince Lombardi's innovation. This historic play outline begins on page 14 of the playbook. It is where the power sweep is illustrated, first with the play "49 Strong Side." 1966 was the first year of the NFL and AFL integration. In 1965 the plans were unveiled for the first ever "NFL - AFL World Championship Game" which then became the "Super Bowl". In 1966 the Green Bay Packers won the Super Bowl using this playbook available for purchase in file download or bound hardcopy US Mailed to you. This is the actual 1966 Green Bay Packers Offensive Football Playbook that you are purchasing. Your download begins when you finish placing your order for the Football Playbook. Sometimes it opens beneath all windows; minimize all to get down to your desktop. Email cgossett2001@yahoo.com to verify if you do not immediately receive notice of your PDF file downloading after your purchase. There is every chance you are going to want to buy the file download or hardcopy for yourself if you are a fan of the Packers, or a coach, or a player of Madden because it will really teach you a lot about the goings on.